Powers/Abilities: Akivasha is immune to the effects of disease and aging. She possesses enhanced human strength and survives off of the blood of living beings. She claims that her bite can make others immortal as well. She apparently sleeps in a sarcophagus. Akivasha is presumably a vampire, and if so would possess their typical powers and weaknesses, with some possible variation. She may or may not have been able to alter her form to become mist, or a wolf, bat, etc. She likely had some vulnerability to religious icons, although, like Varnae, these would probably only have been those that existed prior to her creation. She may or may not have vulnerability to sunlight, and the other various limitations of vampires. As she was only seen briefly, her powers and limitations are limited to speculation. Although it cannot be determined from the black and white pictures seen here, Akivasha has ivory skin. "I am she whose only sin was that I loved life--and to win life, I courted death! I wooed darkness as his lover, and his gift was life...life that, not being life as mortals know it, can never fade! --I am the woman who never died--who, men say, was lifted into the skies by the gods in the full bloom of youth and beauty. But, men are fools...for, it is not in the skies but in the shadows that mortals may find immortality. Ten thousand years ago I died--that I might live forever!" Whatever her nature, Akivasha's name became legend the world over. She apparently remained in Stygia, eventually coming to dwell in the Temple of Set, in Khemi, the capitol of Stygia. There she dwelled in the shadows, living off of priests, magicians, and virgins captured and brought to her. "Love me, O Man! Give me your blood to perpetuate my youth--and I will make you too immortal...for I weary of priests and magicians and captive screaming virgins! I desire...a man. Love me, barbarian--love me!" As her teeth pierced his neck, Conan overcame her spell and hurled her away. He drew his sword and threatened to cut her in half if she approached him again. Then her chamber went back and Conan rushed out of it in a mad panic, leaving behind her sweet, hellish laughter. I've only recently started reading and indexing my now complete collection of Marvel's Conan stories. I'm not aware of any further appearances of Akivasha, but I can't believe they wouldn't have ever fleshed her out more! Pre Greg O: According to the Index of Hyborian Names Akivasha's name is derived from the Egyptian name (Elwesh or Akkaiwasha) for the Achaioi or Achaeans (in archaic Greek Achaiwoi). --I place the Hyborian era as beginning shortly after the great Cataclysm (18, 000 BC), although it came to exist as it was usually seen around 12, 000 BC-10, 000 BC. Conan's adventures take place @ 10, 000 BC. For a truly excellent pre-modern era Chronology of the Marvel Universe, check out Robert Wicks' Unofficial Chronology of the Marvel Universe. Akivasha claims to have been active 10, 000 years before her meeting with Conan, which would date her activity back to 20, 000 BC. 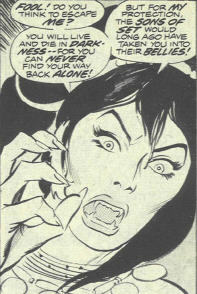 Vampires in the Marvel Universe were created @ 18, 500 BC, during the reign of King Kull, and before the Great Cataclysm. If Akivasha existed at that point, she must have survived via sorcerous means, and may or may not have been a vampire, or at least not of the traditional variety. Other types of vampires are discussed in the comments under Lilith. Akivasha may be some sort of demon succubus. Alternatively, the reference to 10, 000 years ago may have hyperbole. She claimed to have been active at that time in Luxor, Stygia, which did not come about until after the great Cataclysm, closer to 15, 500 BC, in which case she may be a standard vampire. This makes the most sense to me. Or there could have been time travel involved, allowing her to have traveled back to 20, 000 BC. Or I could be over-analyzing a character that appeared for 5 pages, over 25 years ago. Let it go, man...just let it go. Akivasha was used in the Kull the Conqueror movie, played by Tia Carrere (mmmm....Tia Carrere). Of course, every good king needs a queen, and soon Kull is wed to Akivasha, a ravishing redheaded beauty. Well, redheaded in any case. One small problem, as Kull soon finds out, is that Akivasha is actually a 3000-year-old demon priestess, resurrected by Taligaro and his henchmen in a plot to seize power from Kull. Why they need a demon priestess to do this is not entirely clear. It turns out that Akivasha is a priestess of Acheron, who was defeated by the great god Valka in time immemorial. Valka left one trace of Acheron; a column of his evil flame burns day and night high above Valusia as a warning to all the people, a reminder of godless times. Akivasha plans to open the doors of Hell itself and allow Acheron to reign once more. Soon Kull discovers Akivasha's treachery. Time is short, for she has set forces in motion that will free Acheron during an approaching solar eclipse (naturally). He has only one chance to stop her: he must sail north, find the Isle of Ice, capture the Breath of Valka, and extinguish Acheron's flame once and for all. Only then will Akivasha be defeated. Taligaro, who by now realizes that Akivasha has betrayed him, figures this out as well and the race is on. I should have you blinded and driven into exile for mentioning that movie. *ahem* Anyway, Kull was perhaps THE most pathetic adaptation of anything Robert E Howard ever put pen to forever and ever amen. Basically, Kull's plot was a bastardized version of the classic Howard tale "A Witch Shall Be Born" but instead of Salome, they used Akivasha - - the name of a female vampire that briefly appeared in Conan the Conqueror (formerly Hour of the Dragon). The Akivasha of the Kull the Conqueror movie was a composite character taking the vampiric Stygian princess's name and Salome's crescent shaped birthmark and throne-usurping ways. Further Acheron was an empire, not a god - - though if I were going to be generous I could allow for the empire being named after some dark god - - except for the fact that the Acheronites worshiped Set, same as the Stygians, and that I hated the movie. I would try to give you a summary, but I have all but purged this flick from my memory. I waited so long for some new Howard adventure to become a movie and got - - Hercules the Movie. I do recall she used her magic to remove a caul over the eye of one of her worshipers and then slapped it back on later when she got pissed at him. I remember the pillar of flame. I remember the temple of ice or whatever. I remember Akivasha enchanting Kull and his liberated slave girl trying to warn him. Really, I have no idea where this movie's storyline comes from. I am something of a Howard purist so if anyone wrote Kull stories other than Howard I haven't read them (except for the comics which I consider a whole other kettle of fish). As for a movie - - what would have been wrong with Kull as a youth amongst the tigers, Kull later amongst the Atlantean Sea Mountain tribe, Kull slaying the girl rather than watch his tribesmen ritually torture her and then burn her to death, Kull leaping into the sea to escape, Kull being pulled out of the sea by a slave-galley, Kull escaping and becoming a gladiator in the arenas of Valusia, rising through the ranks of the Red Slayers, and eventually killing Mad King Borna. Toss in a subplot with the <Baron> Kaa Nuub and the Serpent Men planning to take over the Thurian continent and Brule the Spear Slayer coming to warn Kull or maybe the Mirrors of Tuzun Thune. Kull never really had a love interest, but I'm sure a slave-girl or something could have been tossed in. GAH! It drives me nuts! I could have made a better Kull movie in my sleep! In Blade III#12 a prophecy was fulfilled that brought back all vampires that ever died. This most likely included Akivasha as well. We'll have to wait if she resurfaces although it is unlikely because she is part of the Conan universe.